The situation in Syria was momentarily stabilized at the beginning of this week when on September 17th, Recep Tayyip Erdogan and Vladimir Putin announced the establishment of a demilitarized buffer zone in Idlib Province. The zone is 14-19 kilometers wide, and it has both Russian and Turkish patrolling the perimeter. Heavy weapons, as well as any presence of rebels, are to be removed from the area. Syria under the rule of Bashar al-Assad has left the region, and the world, a much more hostile and dangerous place. From the revolution’s inception in 2011, the country has suffered catastrophe after catastrophe. The rise of ISIS fractured both Syria and Iraq, preventing either government from effectively governing. 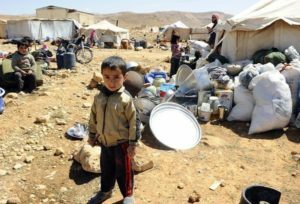 As fighting intensified between the Assad regime and various opposition groups, refugees swelled into Lebanon and Turkey (both nations host a combined 2 million Syrians displaced by violence) and continued their way north to Europe. Geopolitically, Turkey has a lot to worry about if the newly-emplaced buffer zone fails. A rebel-held Idlib province allows Turkey to exercise its influence in the region. This is crucial to its national security interests, as Kurdish militias already control some territory in the country, as well as large swaths of land in Iraq and Syria. If the zone fails, the militias may wait out direct fighting between Turkey, Syria, and Russia before moving in and establishing Idlib as their own. Separately, Putin’s friendly relationship to Assad has led to the creation of Russia’s Khmeimim air base—a military stronghold where Moscow can exercise its power in the Middle East. If Turkish-backed rebels lost their support, Russia could deploy troops, alongside Syria, to secure the area; which in turn would weaken Turkey’s position in the Syrian revolution. Moscow has been extremely successful in retaking rebel-held suburbs around Damascus and in the country’s South. Or, worst case scenario, a Russian-backed assault in Idlib could result in a direct confrontation with Turkish troops, where thousands of opposition soldiers and millions of citizens would be caught between the crosshairs. Currently there is a split in approval over the buffer zone among the opposition groups, with Jihadist groups rejecting the deal while some embrace it. On Sunday, the UK-based Syrian Observatory for Human Rights (SOHR) published statements from both the Turkish-backed National Liberation Front and the jihadist group Hurras al-Din concerning the deal struck between Ankara and Moscow. SOHR earlier reported that Hurras al-Din, Ansar al-Tawhid, Ansar al-Din, Ansar Allah, al-Furqan Gathering and Jund al-Quqaz, along with other jihadist factions operating within Hay’at Tahrir al-Sham, have all refused to withdraw from the buffer zone—nor will they part with their weapons. The United Nations has warned that any form of assault on Idlib province could lead to “the worst humanitarian catastrophe of the 21st century.” This is a developing story.